'The butterfly effect' is the name given to a theory that suggests that the tiny flap of a butterfly's wings can influence weather patterns weeks later and thousands of miles away. It's a rudimentary example of how chaos theory works. Small and relatively insignificant events affecting something much larger and seemingly unconnected. Richard's cloud paintings are inspired by the same deterministic chaos theories – summarised by Edward Lorenz in the 1950s. Clouds have a particularly sensitive dependence on initial conditions. These giant nebulous sculptures are shaped by an infinite number of large and small events. 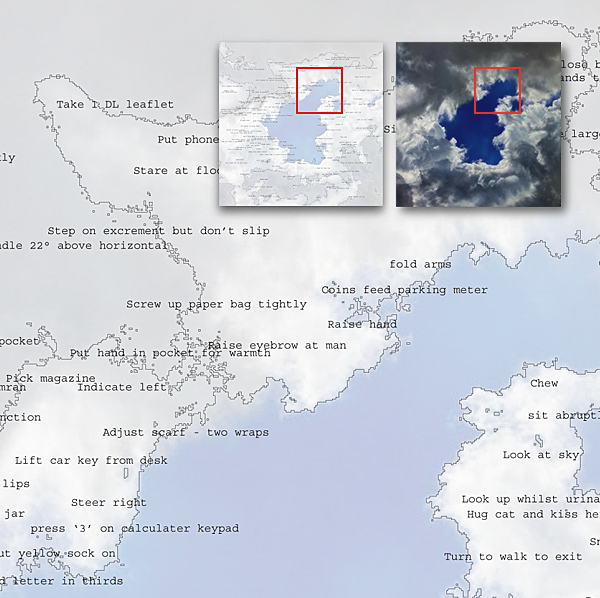 Richard imagines that our own daily activities could theoretically shape the skies and sculpt our clouds. Could the clouds he paints have been shaped by his own actions? Richard was shortlisted for the Celeste Prize in Italy for his conceptual work 'Voyage' and 'Voyage Key'. Voyage Key details movements that Richard made during a mundane but routine visit to his local bank. Each tiny component of this voyage is mapped to his oil painting of a particularly impressive sky. In fact, all Richard's 'Nebulous' paintings are chaotic expressions of different events in his life. Each work is named accordingly. 'Nebulous' paintings are not sold with the associated 'Key' annotation.